This book is right up my alley. I live in Colorado and have been photographing wildlife for a few years. Author/photographer/lecturer Don Mammoser, who also lives in Colorado, has made it a little easier for those of us who would like to venture further afield for our photographs. He's chosen spots in the Rocky Mountains but states that his choices are not all there is to see - we all see opportunities in different places and find subjects where others don't. Use his book as a guide, hence its name. Mammoser is also a photography teacher, and he imparts helpful information on camera equipment and techniques. 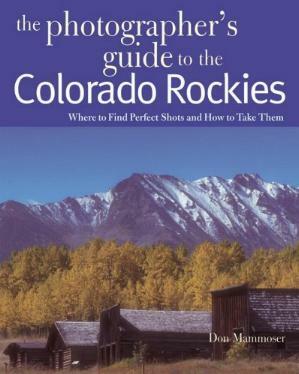 Some of the areas covered in this book include, among others, the Rocky Mountain National Park, Steamboat Springs, Central Colorado, Durango, Telluride, and the Gunnison area. And in each instance, we're given great tips on where to see what, and at what time of the year. And naturally, this book has loads of his photographs to admire and learn from, as well as helpful photo tips to note. I now know more of where and what I want to see in this beautiful state. I do agree with Mammoser in that I also don't "fix" my photos on my computer - my aim is to get it right the first time. Visit Mammoser at his website. Conclusion - Very useful, informative, and inspirational advice for both travelers and photographers.